Let me start off by first saying that my reading interests tend to fall more toward historical romance rather than fiction so I wasn’t entirely sure how I would react to a novel about war. I’m pleased to say this novel turned out to be much more than that, a real page turner from start to finish, one I pretty much read through in one sitting. Perhaps part of the reason is because Warrior King Legacy is much more than a play by play list of what is known from history about the Gaul king Vercingetorix. 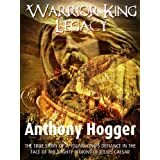 This talented author was able to take what was known about the real Vercingetorix and use his imagination to weave a story this reader could not put down. Yes, there is a lot of blood, guts and violence involved. It was a savage era where only the strongest could survive. But there was also a softer side, the romance I craved, where Vercingetorix is shown with his wife, family and close friends. It shows the close bond developed when warriors must rely on each other on the battle field. All together it brought across a close connection I need with a character to become truly engaged with a story. History tells us some of what happened when Vercingetorix worked to pull the tribes together in his quest to go up against Rome’s Julius Caesar, but it doesn’t give us a view into the pain, betrayal and heartache the king and his people faced on a daily basis. I cringed more than a few times while reading, the vivid description given easily setting off my own imagination. If you enjoy history, or just love a fast-paced war type, I think Warrior King Legacy will be right up your alley. I know I’m looking forward to reading more by Anthony Hogger. Posted by Denna Holm on September 24, 2014 in Archives and tagged historical romance, history, Julius Caesar, Rome, Vercingetorix, war.